Radiant Life Technologies are the manufacturers of "The Greatest Breakthrough in Holistic Healing This Century" - which appears to be some kind of laser-powered shower-head. Gisele Delmar - the unfortunate "UK representative" promoting this worthless piece of gadgetry - handed me a flyer (available here and here) at the weekend. ASA complaint follows and, I promise, it's not worth reading. "I write to complain about a flyer I picked up at the CamExpo exhibition in London on 24th October this year. 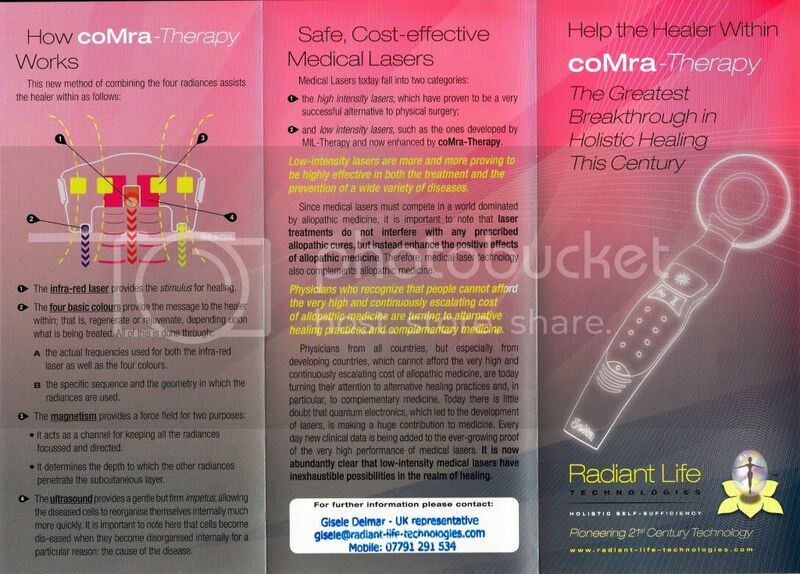 The flyer, for Radiant Life Technologies, promotes some kind of miracle-medical-breakthrough-laser-gadget-thingy. I suspect that the flyer may be in breach of three sections of the British Code of Advertising, Sales Promotion and Direct Marketing (CAP) code (2010). I can provide the original flyer by post, if necessary. 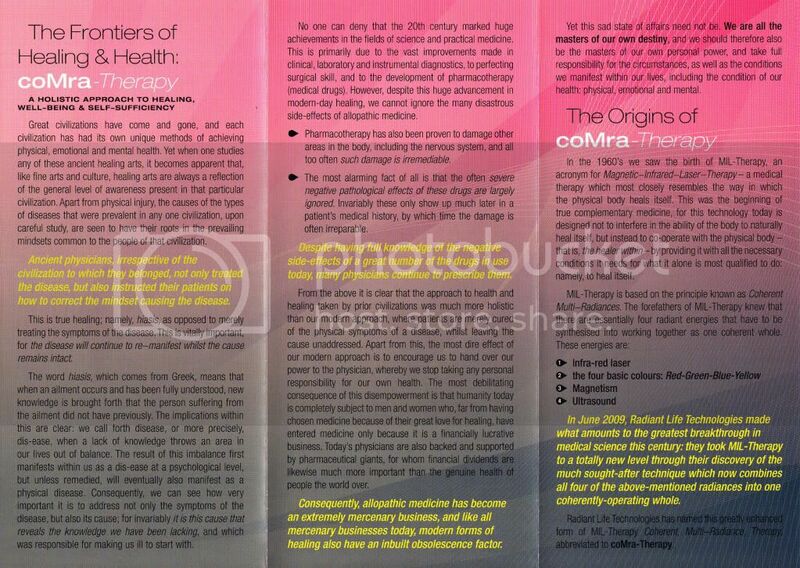 "Help the Healer Within - coMra-Therapy - The Greatest Breakthrough in Holistic Healing This Century"
2. This astonishing breakthrough has not yet found its way into the medical literature. A search of PubMed  did not produce any results for "coMra therapy". Even the manufacturer's own website  does not cite any research; neither does the flyer. 3. The advertised device is a small hand-held gadget vaguely resembling a shower head. It is advertised for sale at 595 euros (excluding VAT). (i) "MIL-Therapy, an acronym for Magnetic-Infrared-Laser-Therapy" is a "medical therapy which most closely resembles the way in which the physical body heals itself." (ii) This "technology" is able to avoid "interfer[ing] in the ability of the body to naturally heal itself" and yet "co-operate with the physical body - that is, the healer within - by providing it with all the necessary conditions it needs for what it alone is most qualified to do: namely, to heal itself." (iii) There are "four radiant energies that have to be synthesised into working together as one coherent whole" to achieve this healing, namely "Infra-red laser - the four [sic] basic colours: Red-Green-Blue-Yellow", "Magnetism" and "Ultrasound"
(iv) "In June 2009, Radiant Life Technologies made what amounts to the greatest breakthrough in medical science this century: they took MIL-Therapy to a totally new level through their discovery of the much sought-after technique which combines all four of the above-mentioned radiances into one coherently-operating whole. Radiant Life Technologies has named this greatly enhanced form of MIL-Therapy Coherent, Multi-Radiance, Therapy, abbreviated to coMra-Therapy"
(v) "The infra-red laser" on the device "provides the stimulus for healing"
(vi) "The four basic colours provide the message to the healer within..."
(vii) "The magnetism provides a force field" which "determines the depth to which the other radiances penetrate the subcutaneous layer"
(viii) "The ultrasound...[allows] the diseased cells to reorganise themselves internally much more quickly. It is important to note here that cells become dis-eased when they become disorganised internally for a particular reason: the cause of the disease." (ix) "Low-intensity lasers" like the advertised product are "proving to be highly effective in both the treatment and the prevention of a wide variety of diseases...[these] lasers...enhance the positive effects of allopathic medicine." (x) "It is now abundantly clear that low-intensity lasers [like the advertised product] have inexhaustible possibilities in the realm of healing." (i) The highlighted text "Despite having full knowledge of the negative side-effects of a great number of the drugs in use today, many physicians continue to prescribe them"
(ii) The highlighted text "...allopathic medicine has become an extremely mercenary business, and like all mercenary businesses today, modern forms of healing also have an inbuilt obsolescence factor." (iii) "Pharmacotherapy has also been proven to damage other areas in the body, including the nervous system, and all too often such damage is irremediable"
(iv) "...often severe negative pathological effects of these drugs are largely ignored. Invariably these only show up much later in a patient's medical history, by which time the damage is often irreparable"
6. I confirm I have no connections with the advertiser. I confirm I am not involved in legal proceedings with the advertiser." Just hurry past before the stupid rubs off! If you read the info on the website you find a lot of "word salad" - that is, high-faluting language meant to sound meaningful but really so complicated as to be confusing and lacks much, if any, meaning. The biggest alarm-bell however is the fact that there is no research published/associated with this "discovery", this leads one to be believe the whole enterprise is a money making scheme first and foremost. I had a quick look at your website, but none of it appears to be related to the Quantum Laser Showerhead. If you have any research about the actual product mentioned in the complaint, I'd be delighted to hear about it.